New Turf Field Open for Play at Mamaroneck High School! Mamaroneck High School students have been enjoying practicing this week on the new multi-purpose Memorial Field. 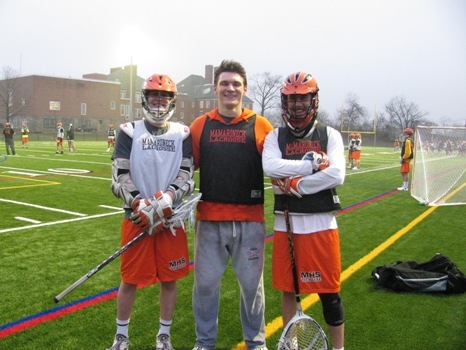 Lacrosse players Peter Conley (sophomore), Sam Christiansen (senior), and\Thomas Brill (sophomore), pictured above, take a break during practice last evening to reflect on the field improvements since the previous season. A ribbon-cutting ceremony is planned as part of the field dedication events at 5:30 pm on Saturday, April 2nd. All community members are invited to attend. The new all-weather Memorial Field is one of only three regulation-sized athletic fields on school property. It is the District’s only all-purpose field large enough to host varsity boys and girls lacrosse, field hockey, boys and girls soccer, track & field and football games. (The other two fields are used exclusively for baseball and softball.) The field will be used by more than 20 different school district teams, in addition to physical education classes, and community youth leagues; the field’s precision lighting adds a new dimension, including the ability to conduct evening practices and hold night games. The grand re-opening of Memorial Field represents the completion of phase I of the district’s long-range field renovation plan. Phase 1 included reorienting the field and installing a resilient synthetic turf surface that will be able to withstand heavy use every day. This phase also included demolition of the previous site; installation of drainage; installation of lights, and new bleachers that can be moved to the visitors’ side when permanent bleachers are eventually constructed. Future phases would include the installation of a large oval track around the turf field; permanent, larger bleachers; and a press box, concession stand, and restroom facilities. - District contribution of $500,000, approved by voters in 2004 for this project. - Donation to the district of $855,000 from Larchmont-Mamaroneck Fields for Kids. This included generous contributions from more than 500 private donors; and significant donations from the Larchmont Junior Soccer League, Larchmont Mamaroneck Youth Lacrosse, Mamaroneck Youth Football League, and Larchmont Mamaroneck Little League. A generous gift from the family of Rudolph and Alix Laager made the installation of the lights possible during this phase. - Pledge of $250,000 from Assemblyman George Latimer and the State of New York. - Donation of the new scoreboard and sound system from Mamaroneck Schools Foundation. - Demolition services donated by community member Joe Naclerio and his company Greenline Industries (an estimated cost savings to the District of $56,000). Several games are scheduled to take place on the turf on Saturday, April 2 nd , including JV Girls Lacrosse (11 am, vs. Yonkers), JV Boys Lacrosse (4 pm, vs. Ardsley), Varsity Girls Lacrosse (1 pm, vs. Yonkers) and Varsity Boys Lacrosse (7 pm, vs. Ardsley). A ribbon-cutting ceremony beginning at 5:30 pm will include entertainment provided by student groups, short remarks by those instrumental to the success in bringing this field to fruition, and an unveiling of the new placement of the Rainaldi plaque in memory of former Mamaroneck teacher/coach/administrator Michael “Butch” Rainaldi. All community members are invited to attend.